This exciting and vibrant country lies at the heart of Europe, and at the heart of European history. With summer long sunshine into the 30s, beautiful countryside and miles of traffic free cycle lanes, you’ll be spoilt by the young companies that we know as friends. 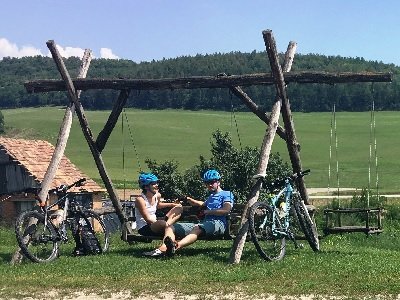 Take a fantastic road tour with Ride Hard Hungary, or an E-MTB Tour with Dreamland Tours, each offering that unique Hungarian culture and welcome. Ride Hard Hungary make sure that your stay is the very best, using 4 star hotels, with famous Hungarian spas to soothe you at the end of each day, you can cycle around magnificent Budapest or along the 77km long shores of pictureque Lake Balaton. Hungary is just a short flight away, so book yourself some sunshine and fun – say #hellohungary! Dreamland Cycling is a dynamic team of youngsters who love cycling, being in nature, meeting new people and having delicious food and drink. This vibrant young company specialise in one day trips and short tours, allowing you to break up your Hungarian holiday and explore by bike with these local experts. Their team is composed of former professional bike racers, experienced tour guides, sports trainers and there’s even some engineers on board. Dreamland Cycling is the first Hungarian company providing all inclusive e-MTB adventure tours around Lake Balaton and in beautiful Budapest. They provide all the equipment and services that you need for an e-MTB adventure. There’s a whole world of history and culture awaiting you in Hungary, with beautiful scenery and long hot summer days. All you need to bring is a sense of adventure!